Alex Heitman had the most liked content! Fishing, Fishing, and umm fishing. Oh forgot. Sunday was freezing in the morning so I stayed in until around 10. Fished for about 3 hours and caught all three species on a swimbait in about 20 ft of water. 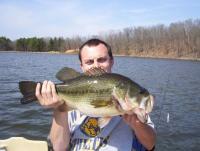 Water temp had dropped into the mid 40’s and had about 6 fish and 4 were just barely keepers. The days are different on this stage. Usually it’s tuesday-Sunday but it’s Friday-Wednesday this time around. Well that did not end up the way I wanted that to come out. It should have said I “always” turn off the electronics when fishing shallow. Nobody has said anything about it but the bass pro tour kicked off yesterday in Florida. I watched some of it between patients yesterday. Some big fish caught but not the avg fish weight I was expecting from Florida. I think today will turn out better and bigger fish will be caught. You can watch it starting at 9am on the major league fishing website. Fished last night and this morning early. Fishing is very tough. Hard to get bites that’s for sure. I had fish schooling all around me for an hour and could only get 3 to the boat. Tried topwster, swimbait, jigs, spoon, and deep cranks. The rule really only applies if you are fishing a tournament. I’ll come out and say I have fished many of those docks during recreational time. I’ve never saw the water patrol before that law but I may be wrong. Megabass, mcsticks, and lucky craft for me. I don’t mind spending the money on Megabass because they work. If you don’t smash them on rocks or a dock they last. Make sure a get a lure retriever with a 20 ft dog leash so you don’t lose them. I’ve caught lots of fish on all three baits. I fish them all on 10 lb invisx fluorocarbon.